Sometimes it seems like we can get so carried away with the daily grind that we have so little time to actually prepare a meal. And sometimes I get carried away with lavish weeknight meals that take me far longer to prepare than I actually have time for. So let me tell you a quick and easy meal that works with almost any fish. As a landlocked native with little to no ties to the sea, fish is a luxury. But the real reason I hardly ever prepare fish is because it stinks, and it lingers, and a week after having it the air is still heavy with the smell of fish. and that just won’t do. Until….I happened on this preparation and my world was changed. I would assume that this is common knowledge for most folks but it was a revelation for me. Bake the fish in a packet. No steam, no fish fat molecules to get into the fibers of my couch and the best part…no fish clean up. 1. 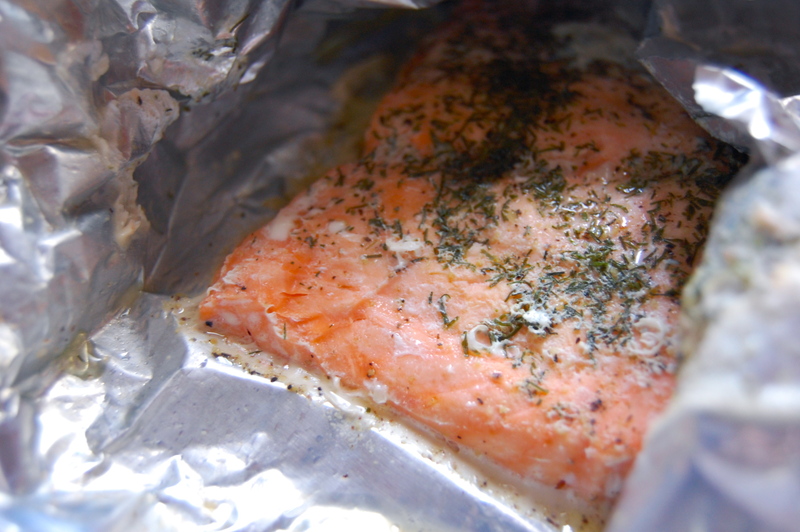 Tear off a piece of tin-foil to accomodate one piece of fish. butter the inside of the foil. 2. Place fish in the middle and sprinkle with salt, pepper and dill. 3. Fold up packet and place into a 400 degree oven to bake. 4. Bake for approximately 15 minutes or until the fish is cooked through. Garnish with lemon.